The sudden and totally unexpected illness and death of the director general of the World Health Organization, Dr. Lee Jong-wook is a major loss to the global health community. Affectionately known as J.W. to his numerous friends and admirers, Dr. Lee was the epitome of the emerging genre of public health experts now known as health diplomats. Dr. Lee believed strongly in the nexus between politics and health, the relationship between governance reforms and international health remedial efforts in impoverished communities, and, the catalytic role of focused and well financed public/private/civil society global health alliances. On meeting Dr. Lee for the first time, you will hardly notice that he is a long-term bureaucrat within the U.N. system. Spontaneous, warm, engaging, and passionate, he left an immediate and lasting impression as a man on a mission. 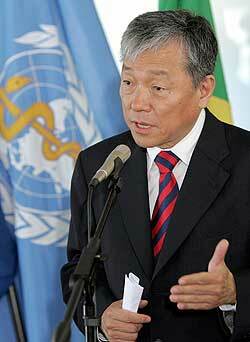 I first met Dr. Lee when I was the vice chairman of the National Council for International Health (N.C.I.H.) — now known as the Global Health Council — in Washington, D.C. At the time, I was serving as the chairman of the N.C.I.H. Strategic Planning Committee that eventually initiated the transformation of N.C.I.H. into the Global Health Council. At the time, Dr. Lee served as the head of the W.H.O. TB initiative. He impressed me as a man totally committed to the control of TB worldwide. Dr. Lee also had very strong views on management reforms, district health systems and the role of ministers of health. In his quiet and unassuming manner, he made his point and did not hide his disagreement on points made during discussions. When I asked Dr. Lee what an established organization like N.C.I.H. should be doing as it transformed itself, he informed me that the key to the future of global health is in emerging, well-financed global health alliances that have the W.H.O. as the technical backbone for dealing with specific health issues and conditions. Dr. Lee advised that large global health organizations should become part of emerging, out-of-the-box thinking on global health policy analyses, health systems development and deployment, and the effective management of international health programs. I also learned an impressive thing about Dr. Lee: he never forgets a face and he will go out of his way to let you know he recognizes you, even in official functions. This attribute served him when he began his surprising quest for the director general position of the W.H.O. Dr. Lee effectively took charge of the W.H.O. and began to lead it to greater heights. Although he had been a long-term staff member, he was not afraid of bold, controversial initiatives and programs. The 3 by 5 W.H.O. initiative to put 3 million individuals living with AIDS on antiretroviral therapy by the end of 2005 in developing nations was not only an audacious move but also as extremely controversial one. However, Dr. Lee skillfully repositioned W.H.O. through the very difficult challenges of meeting the goals and objectives of the 3 by 5 initiative. Seasoned hands at W.H.O. now had a difficult task to accomplish. Up and coming health experts had limitless opportunities to be a part of history and make a difference. Although the campaign fell short of its target, the W.H.O. by overcoming numerous technical, financial, logistical, and political challenges in the 3 by 5 AIDS initiative, regained its role as the premier international health agency. Our heart goes out to the family of Dr. Lee. He was a decent and honorable man. He was a happy warrior who fought hard on behalf of vulnerable individuals and families at the receiving end of the vagaries and inefficiencies of healthcare systems around the world. In his 23-year career at the W.H.O., Dr. Lee came to work everyday, ready to make a difference. I have no doubt he put in his best. And, yes, he did make a difference.